If you live in Southeast Texas, is it impossible to overstate how important it is to have working air conditioning system in your car. If your A/C is blowing hot air, or not blowing at all, you are going to have a bad time. The air conditioning in vehicles has kept us cool since 1933. But nothing lasts forever, our AC components can wear out or become loose at any time. When that happens, you need to visit Elite RV & Car Care. Our technicians offer comprehensive AC performance inspections and expert repair services. We will get you fixed up (and cooled off) in no time. Are You Having Any of These Air Conditioning Problems? Weird, unexplained noises whenever the A/C is turned on. If your car is having any of these problems, we are here to help. Our auto A/C repair experts will comprehensively inspect your vehicle and determine exactly what needs to be done to fix the problem and get your air conditioning running the way you like it again. What is Wrong With Your Vehicle’s A/C? O-Rings, Seals and Hose: These parts can rattle loose and potentially break, causing a wide variety of issues. 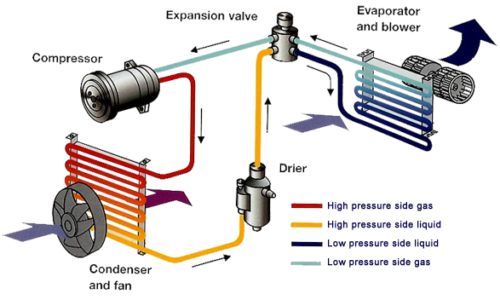 Compressor: A problem with your compressor could prevent your A/C system from having the pressure it needs for circulation. With this, you may not feel any air blowing out at all. Condenser and Evaporator: A malfunctioning condenser or evaporator often results in hot air blowing out of your A/C system. Refrigerant: If you have a refrigerant problem, your R13-A or R12 might need refilling or recharging. No one wants to deal with a broken A/C system in their car. Beyond the discomfort, you need to get it fixed quickly to protect your vehicle. When auto air conditioning systems break down, refrigerant leaks. Not only is refrigerant harmful to the environment, it’s also very harmful to your car. Leaking refrigerant can damage your vehicle’s evaporator and compressor. Getting a car air conditioner service at the first sign of trouble will save you both money and time. The bottom line: Come to Elite RV & Car Care for an expert vehicle AC service repair, we will fix your air conditioning and stop the damage from spreading to other parts of your car. Why Choose Our Humble, TX Auto Repair Shop? At Elite RV & Car Care, our auto mechanics have extensive experience handling air conditioning problems. No matter what the issue is with your vehicle’s air conditioning, we will find the problem and fix it. We are friendly, professional, affordable and most importantly, our team will get the job done right the first time. If you are having problems with your vehicle’s A/C, please do not hesitate to make an appointment with us today by calling (281) 812-3085 or contacting us online. 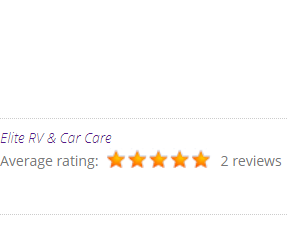 We are located in Humble, and we serve vehicle and RV owners throughout Harris County. What is the difference between R13A Freon & R-12? R-12 Freon is an older form used on vehicles but has since been found to deplete the ozone layer. The EPA outlawed depleting substances in 1994. Therefore we now use R-13A which is better for the environment. If your vehicle uses R-12 we can retrofit your system to adopt the R-13A. Can I recharge my freon at home? We recommend you let an ASE-certified technician recharge your A/C. While you can purchase the proper tools to do it at home, many people have destroyed their compressors by either overfilling or by the sealant clogging their compressors. Why is my car blowing hot air? Most commonly, you may have low refrigerant due to loose connections, old hoses, or leaks. The condenser can only cool the refrigerant if it has air moving over it, if refrigerant is escaping through leaks or loose connections, you’ll still feel hot air.